SAINT AUGUSTINE – In partnership with the Florida Power and Light Company (FPL), the St. Johns County Chamber of Commerce is helping more businesses twinkle with holiday lights in the wake of Hurricane Irma. 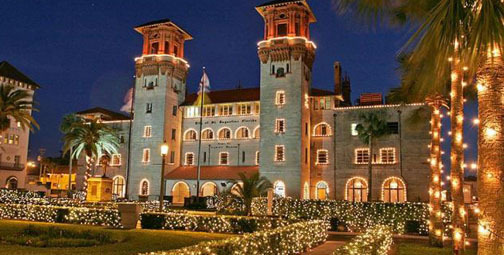 St. Augustine’s Nights of Lights runs until Wednesday, Jan. 31, and attracts international visitors, shoppers and locals to the historic downtown St. Augustine area. The Chamber and FPL launched an effort to help businesses get their lights back on last year after many were damaged during Hurricane Matthew. According to Chamber president and chief executive officer (CEO) Isabelle Rodriguez, business partners that are benefitting from the funding efforts to receive lights include Firestone Complete Auto Care, Athena Restaurant, RE/MAX COAST 2 COAST, Crème de la Cocoa, DOS Coffee & Wine, the American Legion, Tempo, Romeo’s Café, Ancient City Brewing Company and Old City Gifts. According to Rodriguez, the Chamber works hard to help businesses in St. Johns County thrive and expand through a wide variety of business and sponsored partnerships along with programs and services. To find out more information about the St. Johns County Chamber of Commerce, call 904.829.5681 or visit www.sjcchamber.com.